Captain Cook Cruises commenced operating in Sydney in 1970 and for over four decades has proven to be the market leader and premier Sydney Harbour cruise line. 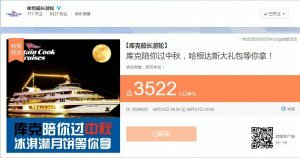 Captain Cook Cruises was interested in strengthening brand awareness among the Chinese community. As a digital marketing solution provider, Digital Jungle had designed a brand new localised website for Captain Cook and took advantage of the Chinese social media (Weibo) to expand its customer base. Digital Jungle utilised social activities to create the brand awareness and acquire new customers. Special promotional campaigns had been conducted on Chinese festivals, such as the Singles’ Day (11.11) and the Chinese mid-autumn festival. These campaigns provided a great opportunity to Sealink that exposed itself to the Chinese audience through Chinese digital platforms. 3,522 people in total had participated in the last digital coupon campaign on the Chinese mid-autumn festival. With good management, Weibo and other social media platforms not only benefit in short term promotion, but also the long term reputation for brands. The Captain Cook’s Weibo account has accumulated 9,327 followers till 17 August 2016. Besides introducing the background and service information of Captain Cook, Digital Jungle has also been posting articles on Weibo with topics that attracted the curiosity and interests of the Chinese audience, such as Australian lifestyles and Australian tourist attractions, in order to position Captain Cook as one of the must-know things for the Chinese tourists traveling in Australia.